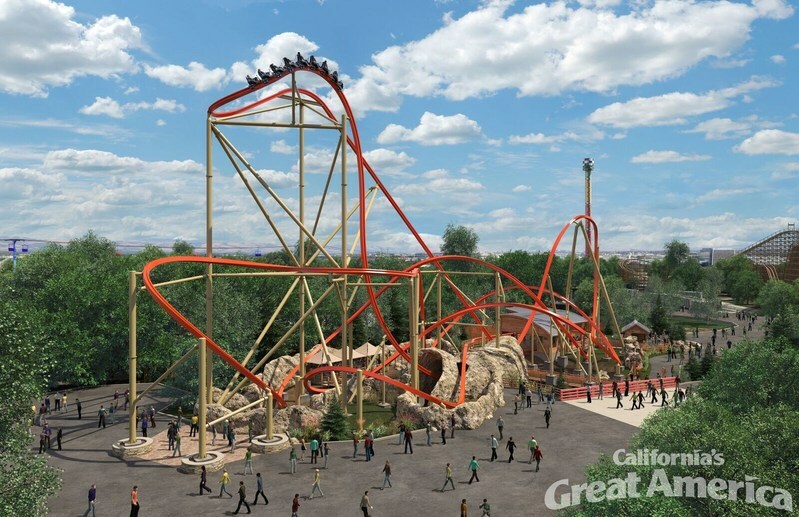 California’s Great America will introduce a groundbreaking new single rail steel coaster, RailBlazer, for the 2018 season. RailBlazer will be the first coaster of its kind on the West Coast featuring a single rail track throughout; the design requires the rider to straddle the rail, creating an extremely low center of gravity that amplifies every move and enables more dynamic turns and rotations than have ever been possible on a coaster. With an eight-passenger single file train hugging the rail, the coaster will give riders an unobstructed view of the ground and air as they speed smoothly over the twisting track. The 2018 Gold Season Pass is on sale now at the best price of the year, and also includes unlimited park visits in 2017. The pass gives guests unlimited access to RailBlazer as well as all the other rides and attractions at California’s Great America, its Boomerang Bay water park and Gilroy Gardens; special events like The Great Pumpkin Fest, HalloweenHaunt and WinterFest; and other discounts and benefits such as free parking. Special pricing ends October 29, 2017. California’s Great America is a 100-acre theme and water park located in Santa Clara, Calif. that contains thrill rides, family attractions and live shows. The park opens for weekends in March, operates daily Memorial Day through mid-August, continues weekends through fall with Halloween Haunt, and the season concludes in December with Winter Fest.